- Spent close to five hours doing trail work on the Sphinx Trail. The trail is easier to ascend than descend so I will go over the trail description descending from the Gulfside Trail (A.T.) in detail and the 'problem' areas where hikers may have been leaving the trail. 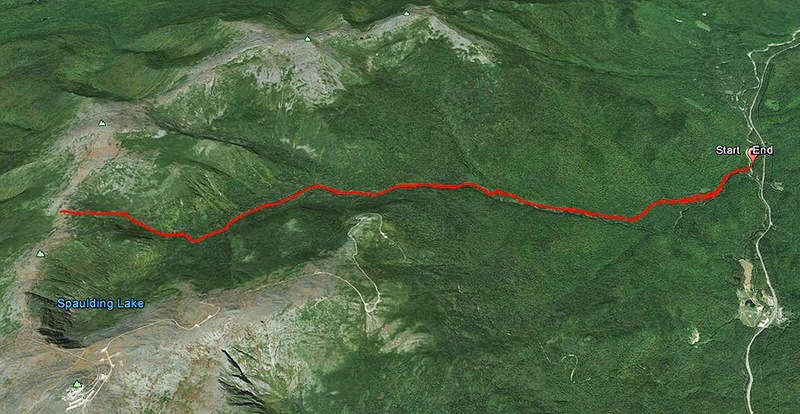 - The Sphinx Trail starts off in the Clay (Sphinx) col and for a few tenths of a mile is above treeline. The trail is easy to follow and there are medium sized cairns leading the way. After this the trail enters the scrub and descends steeply, this section of the trail is narrow, I trimmed back a lot of branches creating an open but still narrow path. The trail then passes by a rock face (on the left) with water streaming and splashing from it. From here the trail coincides with Clay Brook for a few tenths of a mile over rocks and boulders. The trail is wet and slippery, however it's a great place to filter for ice cold water. The trail leaves the brook and descends a rugged dirt, rock, and rooty path. - Problem Area #1: As the trail descends it parallels the brook and eventually takes a sharp right and crosses it over a slab that has water rushing over it. Where the trail takes the sharp right to cross the brook there were faint herd paths to the left and straight ahead leading to an illegal campsite. Hikers were following this and getting dead-ended. I blocked out the beginning of the herd paths and put mini cairns on the other side of the brook. - After the crossing of the brook the trail travels above the cascade and flume over slab then back into the woods. It descends steeply over more rugged terrain of rocks and roots before coming out to the landslide section of the trail. - Problem Area #2: The landslide is to the right of the trail and comes in from an above embankment then goes over the trail. The landslide wiped out the trail and the surrounding trees and vegetation. The trail passes straight over the landslide section, over dirt, gravel, and logs for about one hundred feet then back into the woods. - Once back in the woods, the grade becomes moderate and the footing becomes better. - Problem Area #3: The trail was obstructed by a blowdown. There seemed to be a start of a herd path going around it but hikers may have become disorientated and gotten lost as there was a water crossing, going left, shortly after the blowdown. I sawed off all the branches and blocked off the herd path. The trail is easy to follow again, all that is left is the branchless tree across the trail, you can go under or climb up over the tree. - The trail crosses left over the brook (marked by cairns), then gradual descends a tenth of a mile or so until taking a right and crossing the brook one last time (marked by cairns). The trail is now almost level with the brook flowing just off to the left of the trail. The woods are pretty open and there is another area where it looks like the trail crosses the river, but it doesn't, this may be confusing so I put a cairn up. Over the last tenth of a mile the trail goes through a rocky flat section, then a dirt section, then along the side of the brook where there is a hop, skip, and a jump along the side of the banks of the Clay Brook a few feet away from the Great Gulf Trail junction. Collage of a bear that was just hanging out and having breakfast off Route 16. The Great Gulf Trail has a north west feel to it with the old pine and moss covered boulders and roots. Tensite just after the Six Husbands and Wamsutta Trail junction. Site of the old Great Gulf Shelter and the current tensite area. Great spot to camp! Hmm, I spy a remote slide below the knee of Jefferson! Pretty decent flow for a mid summer day. Looking back at the crossing of the West Branch. If you're good at rock hopping you'll love figuring out this puzzle to stay dry! The Sphinx Trail crosses the Clay Brook numerous times, there are three medium/large ones and one or two very small ones. Entering the Alpine Zone, this sigh seems to be lower than it should but it's in better shape than most! The Sphinx Trail, watch your footing or you're going to get wet and maybe twist and ankle and bash a knee! The trail goes below and to the left where it gets narrow before popping up above treeline. Great place to camp in the winter when there is sufficient snow. No camping allowed when there is no snow. Descending as the clouds and rain come moving through. Hikers above me on the A.T. The trail was scratchy. I trimmed back but left it narrow. Here was the major problem area. At the bottom of this photo the trail takes a sharp right across the brook. Hikers were going left and straight and getting lost. Where the trail crosses the brook. I cut the trees down to open it up a little. On the other side of the crossing. I set up two mini cairns. DO NOT rely on these being there. The trails skirts along the slab above the cascade. West Branch crossing at Chandler Brook Trail junction. Trees will do anything to find the sun they need to grow! Hikes the ski trail back out. A nice little pool of water to take a dip in after a long day! Great pics. Thanks for all your hard work on the trail. What a wonderful photo essay! Thanks, Chris! Glad you liked the pictures, Boggins. Much appreciated! Incredible write up Bill. Your pics, prose and trail maintenance efforts are much appreciated! Thanks for the cairns. They saved us in your major problem area #1 when we had to descend at night and had never been on this trail. It was a relief to spot the cairn across the brook after much searching around to the left by the campsite. The brook was running very strong due to a weeks worth of rain and that crossing just didn't look right so I didn't expect it until I saw the cairn. Hi Jason. Glad you guys were able to spot the cairn and I'm glad it is still up to help lead the way. I'm thinking of putting up an arrow sign on a tree where that crossing is to help out, hopefully the forest service will take it down. They've left the cairns up which in the past they knocked down leading to people not crossing the brook and wandering around and getting lost. I look forward to reading your trip report. Your website is great and very organized! I am going to add it to my list on my hiking links page so hopefully others will go and view it! Have a great rest of the year hiking!